Jürgen Habermas remains an indispensable guide to the unfinished project of democratic consciousness and enlightenment. Not far from Berlin’s Brandenburg Gate lies the Holocaust Memorial, a vast grid of nearly 3,000 concrete blocks that span a field of 19,000 square meters and vary in height. Some rise only to the knees; others loom above the head as one descends the sloping plain to its center. The memorial was built only after a protracted debate as to whether such a sobering reminder of the darkest chapter in Germany’s past should stand at the heart of the nation’s newly refounded capital. By Stefan Müller-Doohm; Daniel Steuer, trans. The pensive man with the snow-white hair was the philosopher and social theorist Jürgen Habermas, who for more than six decades has played the part of gadfly in modern Germany, just as Socrates did in ancient Athens. 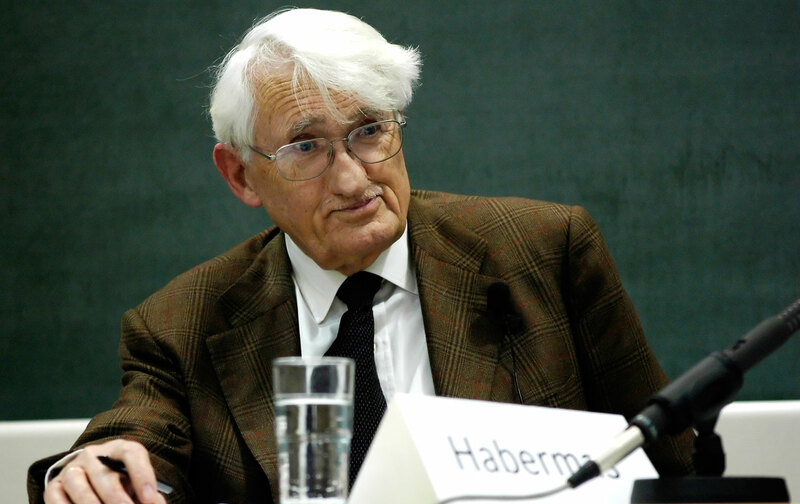 Even at his ripe age—he is now 87—Habermas’s passion remains undiminished. As a public intellectual, however, he may seem an unlikely hero. We live in an age when what some of us still fondly call “the public sphere” has grown thick with personalities who prefer the TED Talk to the printed word and the tweet to the rigors of rational argument. For Habermas, it’s clear that without the constant exercise of public deliberation, democracy will collapse, and this means that citizens must be ready to submit their arguments to the acid bath of rational criticism. The debates that preceded the construction of the Holocaust Memorial brought bitter memories to the surface—the novelist Martin Walser complained of “a monumentalization of our disgrace”—but for Habermas, a willingness to engage productively in self-criticism is a prerequisite for democratic consciousness. National pride in the conventional sense leaves him cold: In an essay for Die Zeit, he responded to Walser, emphasizing that “anyone who views Auschwitz as ‘our shame’ is more interested in the image others have of us than in the image German citizens retrospectively form of themselves in view of the breakdown of civilization, in order to be able to look each other in the face and show each other respect.” Habermas argues instead for “constitutional patriotism,” a sense of loyalty to the principles and procedures of the modern democratic state. For the assessment of a philosopher’s legacy there can be no objective measure. But few would contest the verdict that Habermas has achieved—in both his philosophical work and in his role as a public intellectual—a place of enduring significance that surpasses that of any other thinker in our time. The definitive new biography by Stefan Müller-Doohm, first published in German two years ago and now available in an English translation by Daniel Steuer, lays out the evidence for this conclusion with great care and enormous sympathy for its protagonist. Habermas was born in June of 1929, at a moment when the chances for democracy in modern Germany seemed uncertain. The Weimar Republic had achieved only a partial political equilibrium after the disastrous hyperinflation of the early ’20s, and compromise between the political factions on the left and right remained possible thanks chiefly to the “great coalition” of the center engineered by Gustav Stresemann, the conservative statesman who served as chancellor in 1923 and then as foreign minister until the fall of 1929. Stresemann’s death, nearly coincident with the stock market’s collapse, signaled the beginning of the end for German democracy. The centrist coalition began to unravel; the Social Democrats tried to sustain the government, despite the fact that the German president, the aged and decorated war hero Paul von Hindenburg, was opposed to the republic. Ernst Habermas, Jürgen’s father, was the son of a Protestant parson and conservative in his political beliefs. In the spring of 1933, soon after Hitler came to power, Ernst joined the Nazi Party, and with the outbreak of war in 1939 volunteered for military service in the Wehrmacht. Jürgen was only 10 years old when he became a member of the Deutsches Jungvolk and later the Hitler Youth. But this was hardly an act of ideological conviction—membership at the time was compulsory—and Jürgen escaped paramilitary training by announcing his intention of becoming a physician. It is not irrelevant to note that Habermas was born with a cleft palate and in his early years endured a series of surgical procedures that left him (as he would himself observe) with a strong feeling for human fragility and interdependency. Medical textbooks at the time listed his own condition among the “hereditary diseases,” a fact that may have enhanced his resistance to Nazi indoctrination. In February 1945, the 15-year-old received notice to join the Wehrmacht for the final desperate battle against the armies of the invading Allies, but by a strange twist, Habermas was absent when the military police knocked at the door. Soon thereafter, the Americans arrived, and the war was over. Konrad Adenauer, the first chancellor of the Federal Republic and the standard-bearer for the conservative Christian Democratic Union, campaigned under the slogan Keine Experimente! (“No experiments!”). For Habermas, however, the tyranny he’d witnessed as a child wasn’t a license for present conformity but instead a spur to political criticism. Refusing to forget what had happened in his own country, he became a tireless opponent of all conservative and nationalist values and a fierce champion of what is typically called Vergangenheitsbewältigung, or “working through the past.” Memories of the Hitler era may also explain Habermas’s personal indifference to charismatic authority. Even in the most challenging and technical aspects of his philosophy, one can sense a devotion to the ideal of a public sphere that draws its power from nothing else than rational debate. If there’s a single principle that animates his entire philosophy, it is that power alone is not justification: The only force that can be valid within a democratic system is what he calls “the unforced force of the better argument.” Sustaining this principle is what distinguishes democracy from tyranny. Habermas came to this idea after several trials, and only after he had worked through his own attachments to the less rational strains in German intellectual history. In his uncle’s library, he found works by Kant and Nietzsche; he turned the basement kitchen into a private sanctum where he would loudly declaim lines from Thus Spake Zarathustra. But “in the end,” he later recalled, “the associations with the decrepit slogans of the Nazis…became too embarrassing.” By 1948, his studies had shifted from medicine to history, philosophy, German literature, and economics; he found himself especially captivated by “the opaque rustling” of existentialism. After brief periods of study in Göttingen and Zurich, he moved in 1950 to the department of philosophy at the University of Bonn, where he struck up a friendship with Karl-Otto Apel, a somewhat older recent graduate who had worked under the philosopher Erich Rothacker. Rothacker’s entanglement with the Third Reich had been extensive—he’d even offered radio lectures for Goebbels’s Ministry of Propaganda—but at first his influence on the young Habermas was considerable. Then in his early 20s, Habermas focused on topics such as philosophical anthropology and Wilhelm von Humboldt’s philosophy of language. At the center of his studies, however, was Martin Heidegger. In academic essays and in newspaper pieces, he adopted Heidegger’s characteristic mannerisms, with allusions to “the concealment of entities” and “the emergence of the sign.” By early 1954, Habermas had concluded his doctorate with a dissertation on “the absolute and history” in the philosophy of Friedrich Schelling, the early-19th-century thinker whose legacy flowed into the darker tributaries of modern irrationalism. In the summer of 1953, however, Habermas was confronted with the scandal of Heidegger’s political past. Apel gave his friend a copy of Heidegger’s An Introduction to Metaphysics, a book first published in 1935. In the new edition, a reference to “the inner truth and greatness” of National Socialism remained in place, without explanation and with only minor modifications. Habermas, outraged, responded with an essay published in the Frankfurter Allgemeine Zeitung. “The lecture of 1935,” he wrote, “mercilessly unmasks the fascist colouring of that time.” What troubled him most of all was Heidegger’s failure to offer any explanation after 18 years: Was the “planned murder of millions of human beings,” Habermas asked, a mere signpost along the “history of being”? Or was it not “the foremost duty of thoughtful people to clarify the accountable deeds of the past and keep the knowledge of them alive?” It was time, Habermas declared, “to think with Heidegger against Heidegger.” This moment of political reckoning brought his early phase of existential enthusiasm to a decisive end. For his biographer, however, the incident also marked a turning point in the young scholar’s career. Though Habermas typically avoided confrontation at home, Heidegger belonged to the same generation as his own father; his condemnation of Germany’s most celebrated philosopher took considerable courage. With this act, the 24-year-old had become a public critic. For many sons and daughters who came to maturity in the ’50s, the conservative climate of the Federal Republic of Germany could be stifling. For Habermas, intellectual guidance came from abroad when Theodor Adorno and Max Horkheimer—the two leading members of the Marxist-oriented Institute for Social Research, who had spent the war years in the United States—returned from exile. Habermas corresponded with Adorno for the first time in December 1955 and became his personal assistant and an official member of the newly refounded institute in early 1956. The philosophical intensity of the Frankfurt scene inspired him. The stated aims of the institute spoke to his own emergent belief that philosophy could best succeed in a multidisciplinary alliance with sociology. “Critical theory” meant opposing the mythologies of fascism and reawakening the repressed energies of enlightenment. In an early radio program, Habermas extolled “the Jewish heritage drawn from the German spirit” as a gift that was now “indispensable for our own life and survival.” But he found the culture at the institute somewhat exotic. “I felt like a figure from a novel by Balzac,” Habermas recalled, “the awkward and uneducated boy from the country whose eyes are opened by the city.” Adorno embodied a style of German-Jewish erudition that the Nazis had done their best to destroy. “Time,” Habermas noted, “had two dimensions.” The institute was thoroughly modern but also a remnant of the past. Habermas is rightly seen as an incarnation of the Frankfurt School in its “second generation.” But in intellectual temperament, he is quite distinct from his teachers. From the start, his associations with Adorno were very warm, but he had difficulty with Horkheimer, who regarded him with suspicion and feared that the young man’s public criticism of the West German rearmament program would bring the institute into disrepute. Many years later, following Horkheimer’s death in 1973, Habermas was able to read the full text of a private letter to Adorno in which Horkheimer denounced their student as a revolutionary who would help “the gentlemen in the East.” Horkheimer demanded that Habermas resign. Adorno refused, but relations between Horkheimer and Habermas remained strained. In 1959, Habermas left the institute—a risky decision for a young scholar who was now married with two children. His wife, Ute, was surprised. But with the support of the philosopher Hans-Georg Gadamer, Habermas received a fellowship to complete his habilitation on the idea of the “public sphere,” and in 1961 he secured an assistant professorship in philosophy at the University of Heidelberg. The Transformation of the Public Sphere, published a year later, contained many of the themes that Habermas would develop later in his career. It is often mischaracterized as a purely historical study because it takes note of bourgeois institutions like newspapers and coffeehouses. But the truth is that the book combines historical sociology with philosophy; it traces both the genesis and betrayal of a certain ideal of critical publicity that the European bourgeoisie held out as a promise and yet could never fully realize, thanks to the power and property constraints of bourgeois society. If there’s a single polestar for this argument, it is Kant’s ideal of the Enlightenment as an “age of criticism.” But its Marxist tonalities are no less profound: Critics who find Habermas too credulous in his devotion to public reason miss the fact that his book ends with a grim comment on the “refeudalization” of the public sphere. With the rise of mass-media forms and the distorting influence of money on communication, the ideal of rational criticism that once helped the bourgeoisie wrest itself free from the ancien régime now threatens to dissolve. Publicity, Habermas warns, has begun to resemble once again what it was in the feudal age: a mere performance. This argument pays homage to the earlier 1944 study by Adorno and Horkheimer, Dialectic of Enlightenment, which explores the simultaneously emancipatory and oppressive impact of reason in world history. But whereas the earlier book prosecutes its case with literary allusion and bracing abstraction, Habermas takes care to sustain a bond with social reality. It is this sober and more realistic strain in his thinking that most characterizes his mature work as both a social theorist and a public intellectual. Formidable in his scholarship, Habermas had become, by the late 1960s, a bold and sometimes controversial voice in German politics. He signed a declaration to West German Chancellor Ludwig Erhard that demanded an end to the bombing of Vietnam, and he criticized the national leaders of the Social Democratic Party (including Willy Brandt) for their readiness to compromise with conservatives. In the summer of 1967, the police shooting of the 27-year-old Benno Ohnesorg led to student demonstrations across the Federal Republic. Following the young man’s funeral, Habermas spoke at a conference in defense of the student movement: “It was and still is the task of the student opposition to compensate for the lack of theoretical perspective, the lack of critical awareness of cover-ups and the branding of others as heretics, the lack of radicalness in the interpretation and implementation of our social and democratic constitution.” His support for the students, however, was not absolute. When Rudi Dutschke, a leader of the student radicals, alluded to “alternative forms of action” and “the possible use of violence,” Habermas warned that a “voluntaristic ideology” could easily slip from utopianism into what he called “left-wing fascism.” The phrase carried a considerable sting, especially for young radicals who had cultivated a self-image as opponents of the fascist past. A decade later, Habermas himself would say that he had “reacted a tad too much as a bourgeois intellectual.” But in retrospect, his warning seems prescient: By the late 1970s, a group of leftist militants had split off into the so-called Red Army Faction in association with Andreas Baader and Ulrike Meinhof and descended into acts of arson, kidnapping, and murder. The moral derangement of these years was only enhanced when German conservatives seized the opportunity to level against Habermas the absurd charge that he had furnished a “left-wing theory” for terrorism. In an age of mass media, those who style themselves as public intellectuals often seem more interested in performance than in genuine dialogue. For Habermas, however, true criticism is possible only in the volatile exchange of arguments between subjects. This commitment to the ideal of rational communication, undistorted by asymmetries of power, received its most elaborate treatment in 1981, when he published the monumental two-volume Theory of Communicative Action. The fruit of a full decade of research and over 1,000 pages in length, the book signaled what some have called a “linguistic turn” in critical theory. But the term can be misleading. Inspired by extensive reading in American pragmatism (especially the semiotics of Charles Sanders Peirce), Habermas’s inquiry into what he and his colleague Karl-Otto Apel described as the “formal pragmatics” of language did not entail a turning of attention away from society. The rationality that Habermas sets out to explore is a kind of immanent utopia, the delicate filigree of rational communication that we fashion with others and rely on whenever we aim toward mutual understanding. It is a social creation—intersubjective, not merely instrumental—and its telos is the unforced ideal of agreement. Skeptics may respond that Habermas expects too much from human reason, but his crucial insight is difficult to evade without falling into self-contradiction. The moment one opts for genuine communication, one has already taken on board the expectation of intelligibility. Every act of communication, however, is a potential risk, leaving itself exposed to criticism. But this is what gives language its democratic edge. For Heidegger, language was the “house of Being,” a conservative idea that ceded to language an anonymous power beyond human amendment or appeal. For Habermas, however, language is a fragile and cooperative project that comes alive only in the space between subjects. Open-ended and potentially universal in its reach, it is the house of mundane reason. But Habermas is a realist about the social utility of the system. Although he still draws a great deal from the Marxist critique of capitalism, he is at heart a reformist social democrat who has made his peace with the endurance of private property and the bureaucratic structures of the modern welfare state. The problem, in his view, is that all too often the fragile lines of communication are distorted or even broken by economic interests—and when this happens, the system can take on the opacity and independence of merely technical imperatives that resist our control. The imperatives of the system can then “colonize” the lifeworld, resulting in a condition that Marx called “reification”: Society confronts us like a frozen and uncanny thing, no longer a reflection of our collective aims. For the last three and a half decades, Habermas’s interests have only expanded. His 1985 work, The Philosophical Discourse of Modernity, brought him into confrontation with poststructuralist readers, especially in North America, who did not welcome his criticism of luminaries like Derrida and Foucault. Two years before, however, Habermas had met privately with Foucault on several occasions in Paris, during which time at least some of his philosophical misgivings about his French colleague had dissipated. Upon Foucault’s death in June 1984, Habermas published a tribute to the philosopher as a partner in thinking through the legacies of the Enlightenment, the theme for a conference they’d been planning together. The recent crises of the EU, both financial and political, haven’t shaken Habermas’s belief in strengthening the institutions of democratic solidarity that can permit the emergence of a truly European identity. The proper response to globalization, in his view, is not nationalistic withdrawal (as in the recent Brexit vote), but enhanced regulation and a support for horizontal procedures of decision-making against the “executive federalism” imposed from above by policy leaders in both Germany and France. Even today, Habermas hasn’t ceased to defend Kant’s ideal of a genuinely cosmopolitan public sphere in which the bonds of reason transcend the old boundaries of national belonging.